Do you have a recipe that’s been on your to-do list forever? Something that you keep meaning to cook, but for whatever reason you keep putting it off? I know I have a few, but green lightning shrimp has probably been on that list longer than anything else. Every once in a while, this recipe will resurface again on The Barbecue Bible Forum and I’ll think to myself, “Self, you really need to make this. Don’t put it off.” And I end up putting it off…again. Stupid Self. A few weeks ago, my friend Kristi at Necessary Indulgences mentioned on Facebook that she had some shrimp and did anybody have any ideas what she should do with it. Of course, green lightning shrimp immediately came to mind, so I suggested it but told her I had never cooked it before. She liked it so much, that once again it moved up my bucket list, but this time I was bound and determined that I was going to cook it. This recipe is courtesy of Steven Raichlen, was shown on BBQ U and can be found in its original format here.Of course I took a few liberties with it. I really don’t know why I can’t follow a recipe to save my life. For starters, I cut the marinade in half as we weren’t feeding 6 people. I guess that’s how it usually starts. We also omitted the lime from the marinade per Kristi’s suggestion since we didn’t want mushy shrimp (citrus cooks seafood). We did not baste the shrimp as it cooked with the garlic cilantro butter (again per Kristi’s suggestion) because melted butter can cause flare ups. And finally, because I’m lazy and didn’t feel like messing with skewers we “nixed” the whole kebab idea and opted to use a grill pan. 1. Rinse the shrimp under cold running water and then drain and blot them dry with paper towels. Peel and devein the shrimp. Toss the shrimp into a large zip-lock bag to marinate. 2. Set aside 1 1/2 tablespoons of the cilantro for the garlic cilantro butter. 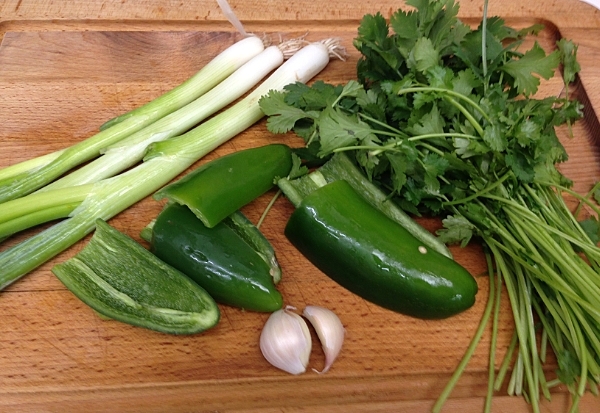 Place the remaining cilantro, the jalapenos, scallions, chopped garlic, salt, black pepper, and cumin in a food processor and finely chop. 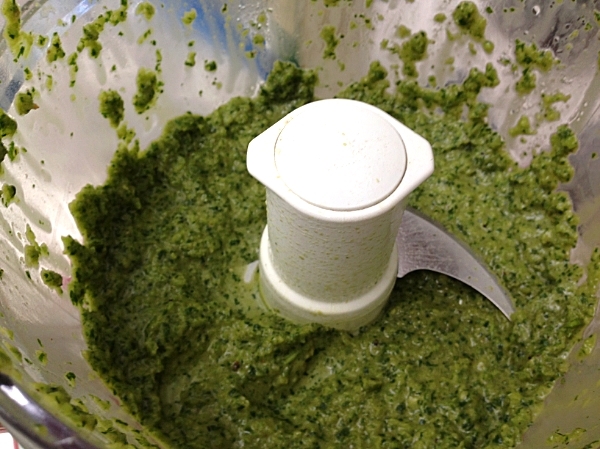 With the machine running, add the olive oil through the feed tube and puree to a bright green paste. Pour this marinade over the shrimp and let them marinate in the refrigerator, covered, for 30 minutes, turning the shrimp several times so they marinate evenly. 3. Melt the butter in a saucepan over medium heat. Add the minced garlic and the 1 1/2 tablespoons of reserved cilantro and cook until the garlic is fragrant and sizzling, but not browned, about 2 minutes. 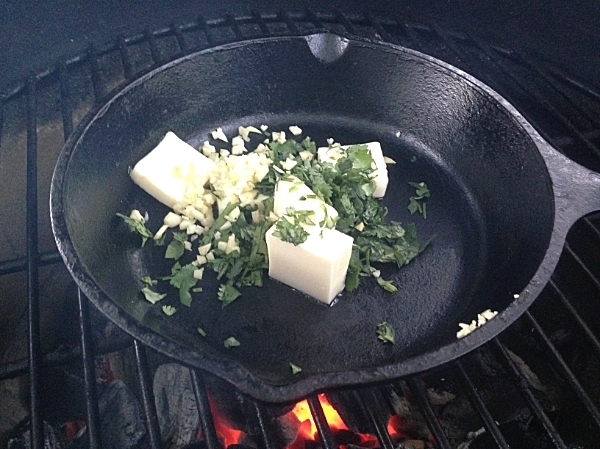 Keep the garlic cilantro butter warm until ready to use. The butter mixture can be prepared on the stove or on the grill. 4. Set up the grill for direct grilling and preheat to high. 5. When ready to cook, spray Pam or wipe down your grill basket with oil. 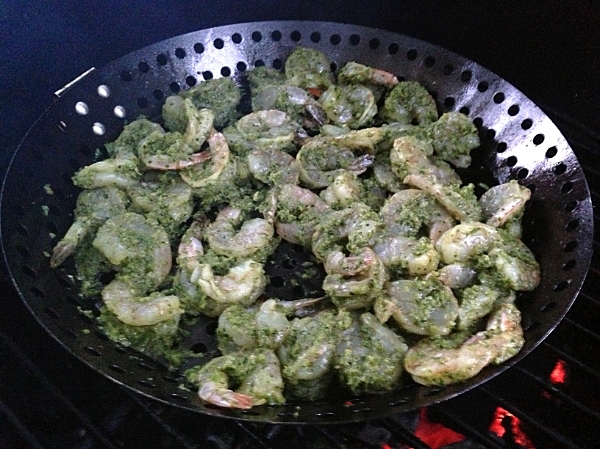 Dump the shrimp, marinade and all into the grill pan. 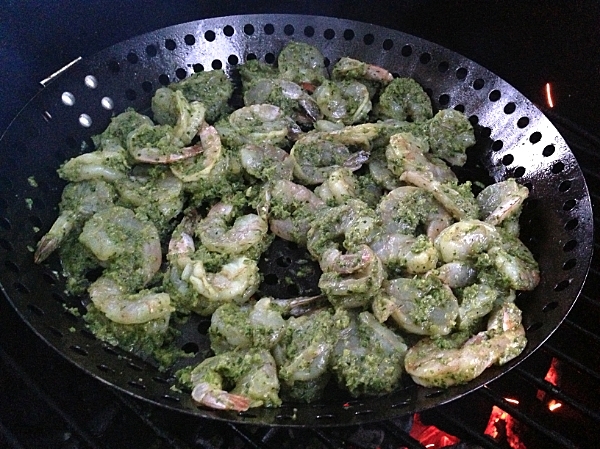 Place the grill pan on the hot grate and grill until just cooked through, 1 to 3 minutes per side. When done, the shrimp will turn pinkish white and feel firm to the touch. 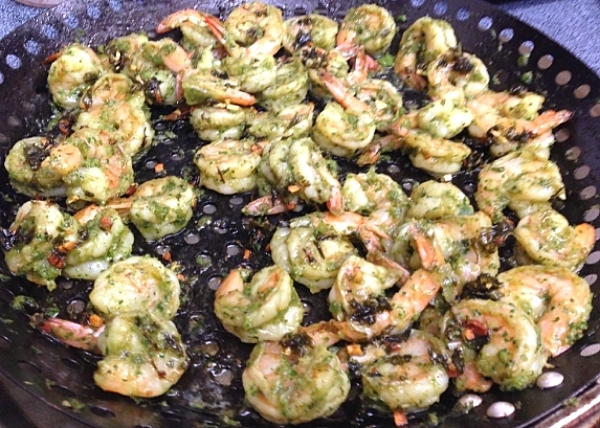 Transfer the grilled shrimp to a platter or plates, drizzle the garlic cilantro butter sauce over them, and squeeze the lime on top. Watch your shrimp carefully. They only take a few minutes and are easy to over cook. 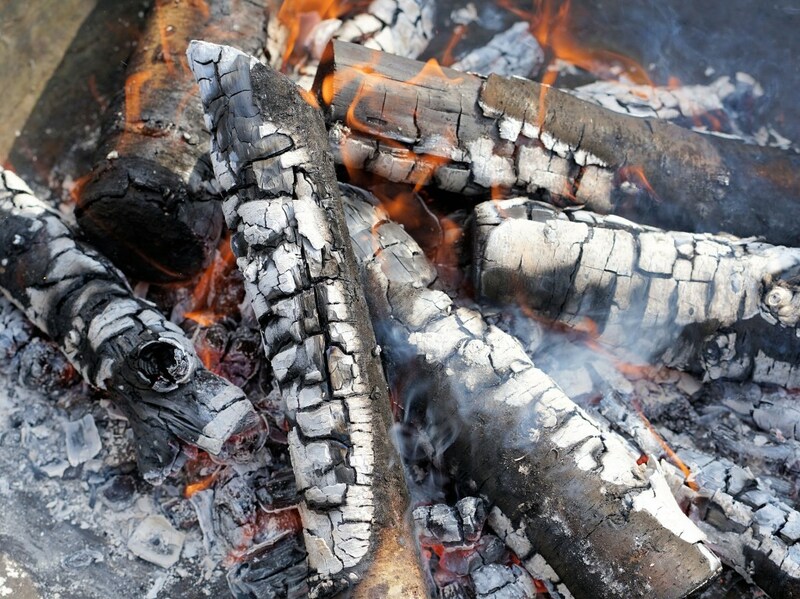 When they begin to firm up and turn pink, they are done. 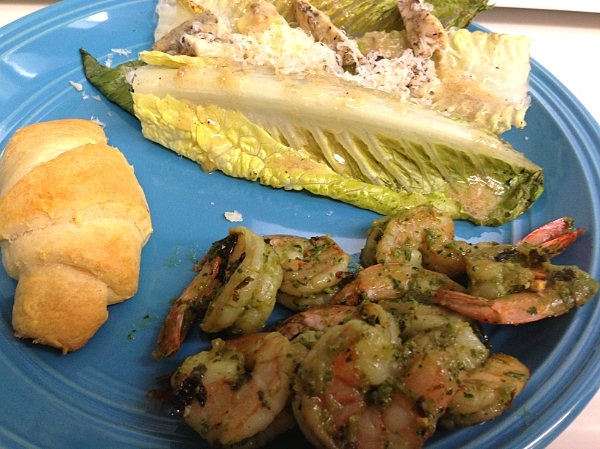 Quick,simple and healthy dinner, served up with some grilled chicken Caesar salad (yes, we grilled the Romaine lettuce as well). Just wish I had taken the time to get better pictures, but the Spurs game was starting and you must have your priorities straight. This looks great and very interesting about omitting lime and avoiding baste. the recipe is all my favorite flavors, so can’t wait to try it this weekend. Thanks! You know how citrus like lime or lemon can cook the seafood in ceviche? Same principle, so I just left it out till the end. Give it a shot and let me know what you think. Garlic, lime, cilantro and chilli? You can’t go wrong! Looks good and I happened to have some shrimp from the Hood Canal I caught that I want to try. I am gonna repost that Grif so it makes my bucket list to try. Cool. Let me know what you think of them. If you wanted to have some lime flavour without the mushy you could just squirt some fresh squeezed lime juice on as they are cooking or just after they are done to zip them up. That’s exactly what we did, Brian, squeezed it on after it was finished. Give them a try. Really good. yes, as soon as I saw that on Kristie’s site, it went on my to do list. I’m going to do it again this week with some home grown jalapenos. I made this yesterday and man these are OUTSTANDING!!! I wonder how this marinade would work with white fish (halibut, chilean sea bass, etc….). I doubled the recipe and have enough for tomorrow. I bet it would work out just fine. So how was the level of heat? Mine were pretty mild, but I think it was the jalapenos. Got a bunch of jalapenos that I am going to pick this week and if the one I ate yesterday is any indicator, the next batch should pack some heat. The level of heat was find I had 6 jalapeños and 6 nice size cloves of garlic. I appreciated the garlic taste. My wife and son do not appreciate a high degree of heat and I got a thumbs up from them. I have to add this to my list as well. I am also thinking “tilapia”, one of our favorites. Thanks! Cool. Let me know what you think and how it works with tilapia.